While it is required that influencers make it common knowledge whether a specific post of theirs is an ad, paid promotion, paid partnership or a sponsored post, audiences still question whether the content is authentic when specific products are used. Just the other week, both NikkiTutorials and Shaaanxo uploaded almost identical videos: Testing one foundation stick against MakeUp Revolution’s new foundation stick. Same day, same video. Upon first glance, it looks like a sponsored post for MakeUp Revolution… after actually watching the videos, you find out it isn’t. The odds of two very similar videos going up at the same time is slim but it happens. The only issue with this is audiences seeing this on YouTube and automatically assuming they’re the same video, set out with a specific brief from a particular brand that was to be posted at a specific time to promote a new product launch. A quick flick through any influencer’s Instagram feed or stories and you’re bound to see “#notspon”, “worked with them before but just showing you that I actually like and use this”, etc. etc. 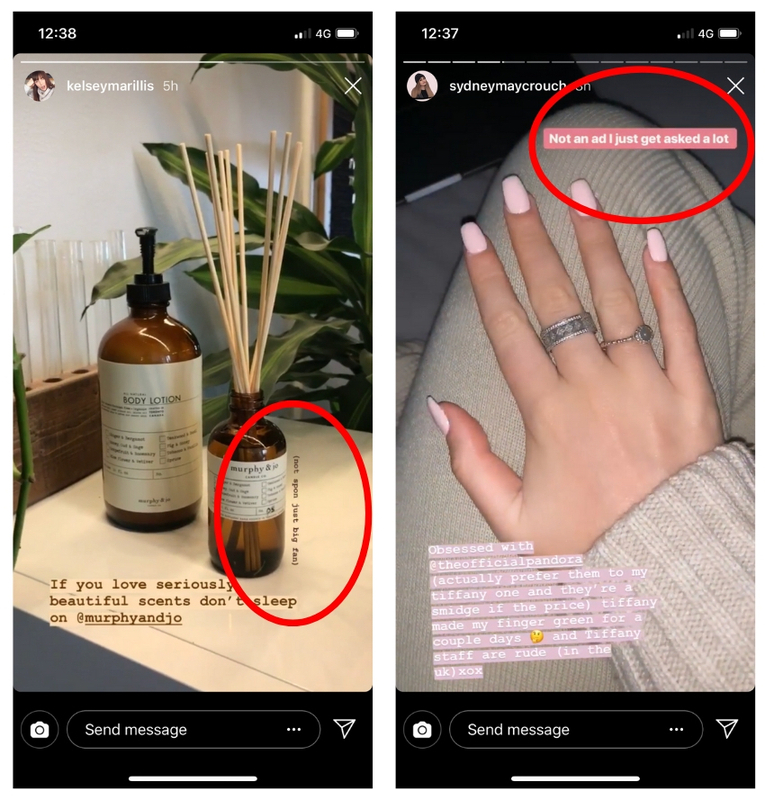 It seems that influencers are so scared of (or fed up with) their audiences and the backlash when it comes to promoting or featuring products, that they have to clarify over and over to get the point across. Some influencers have even started tagging if an item has been gifted to them, just to be on the safe side. Social influencer and lifestyle YouTuber, Lily Pebbles, tries to be as transparent as possible when it comes to whether she spent money on an item or whether it was sent to her in some capacity. Her Instagram stories often contains tags to where items are from, with a *gifted* disclaimer on any items she didn’t purchase herself. In a recent post, she clarified, “I spend a lot of my time emailing brands and explaining that I am happy to try their product… and that no freebie is worth loosing my credibility and audience loyalty that I’ve worked on for 9 years”. Even though modern marketing techniques prove to be successful time and time again, audiences are still so skeptical about the method. On one hand you have influencers on Instagram who get comments like, “Do you only post sponsored material now?” if they post more than one paid post in a row. On the other hand, you have someone who is as big on YouTube as Shane Dawson, who rarely has sponsored videos, receive comments that express how annoyed they are that brands aren’t collaborating with him. It’s a slippery slope for influencers these days. In the good words of Joe Santagato and Danny LoPriore from Santagato Studios, “If you’ve got a bunch of money, I’ll sell anything. And we’ll even say we like your stuff… Even if we never use any of it”. Let us know what you think about paid and sponsored material on social media in the comments.